Scion - What good is wood in streams? 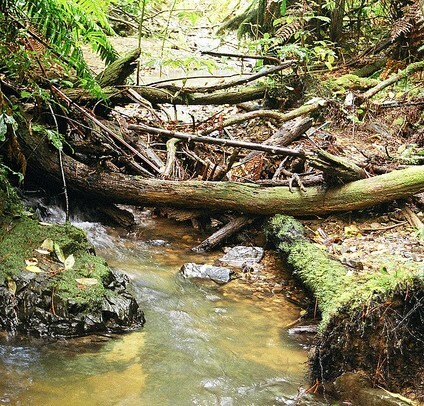 Freshwater ecologist Dr Brenda Baillie has completed a two-year study of naturally forming, small debris dams that have an important positive role as habitat for aquatic invertebrates in forested headwater streams. Debris dams are accumulations of wood, sediment and organic matter. In small forested streams, they generally cover a small percentage of the streambed and often contain a high proportion of the total organic material in a stream system. Debris dams form structurally diverse habitats that provide shelter and trap leaf litter that goes on to become a major source of food for aquatic invertebrates in small forested stream ecosystems. As such, aquatic invertebrate density and diversity are typically higher in debris dams than in the surrounding stream bed. A study in three headwater forested streams found that densities of Ephemeroptera (mayfly), Plecoptera (stonefly) and Trichoptera (caddisfly) taxa were significantly higher in debris dams compared to the habitat in riffles (a rocky or shallow part of a stream or river where the water flows brokenly). Debris dams also contained a higher number of less common taxa and significantly higher densities of shredders (invertebrates that shred larger leaves into smaller particles of organic matter). Brenda’s work suggests that in forested streams, debris dams are important storage sites for organic matter and create areas of biodiversity hotspots for aquatic invertebrates. Retention of forested riparian margins along stream edges are important for maintaining the natural processes of wood and leaf litter inputs into small forested streams. These sources of organic matter contribute to in-stream sources of food, habitat and aquatic invertebrate biodiversity in forested stream ecosystems.